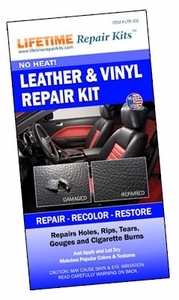 Our NO HEAT vinyl & leather repair kit enables everyone to get near perfect results at home. Works like a liquid leather or vinyl patch, with a near-perfect match! This is a long lasting, very strong repair that we guarantee will work! Our improved formula is even more flexible, so it holds strong and looks natural on virtually any surface without flaking or cracking. This is particularly important for car seats, leather coats, or leather furniture. It's so easy to use: Just mix the colors to match the damaged material using the included color matching guide, apply with the spatula, cover with our special grain matching paper, then let dry overnight. Repairs holes, rips, tears, gouges, cigarette burns and more. Easy to use: Just apply and let dry. Seven intermixable colors to match nearly any surface and texture. One kit makes multiple repairs. Rips, holes, burns and gouges in seats, dashes, car tops, car trim, door panels, chairs, sofas, vinyl floors, belts, marine upholstery, boots, footwear, clothing, purses, steering wheels, luggage and MORE. This kit contains everything you need to make multiple repairs! This is simply the best value no-heat leather and vinyl repair kit on the market!